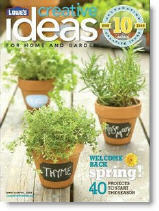 Lowe's Creative Ideas for Home and Garden is a free, bimonthly magazine targeting home décor and outdoor-living enthusiasts shopping in a Lowe's stores. Editorially, the magazine is filled with project ideas, solutions, how-to information and innovative products from Lowe's and is designed to position Lowe's products and services as the first choice for customers home improvement needs. The Garden City Telegram is published Monday through Saturday. It is available for home delivery or at newsstands. Tweens—kids spanning the ages of roughly 8 to 12 years old—are a highly coveted segment for marketers. According to some estimates, tweens spend over $50 billion in goods and services each year. They also influence their parents' decisions on major family purchases as well. Tweens are complex: Too old to want to be totally dependent on their parents, too young to have a work permit. Tweens don't fit easily into any category. Tweens spend half their waking hours in school and much of their extra time in extracurricular activities and new media. At no other time in history have parents and grandparents spent as much on nonessential products and services for their children. For businesses, this translates into designer-inspired bedrooms, expensive concert tickets, and high-priced video-gaming systems. Tweens have money to spend from allowances, birthdays, chores, and more. If they don't have the money, they simply ask their parents to buy it for them. Tweens are at a unique stage in life when they have nothing else to spend money on but themselves. It's even before they have to spend money on their first cars, dates, or proms. Tweens know and recognize brands through traditional media, new media, and marketing. Unlike their more price-sensitive parents, tweens know what they want and will buy it again and again. Tweens can communicate the pros and cons of a brand effectively. They not only sell adults they know, but also share their opinions with their friends via a variety of media. Capturing the interest of the tween market now can be a good investment. In the very near future, these tweens will begin to make major consumer buying decisions on their own. Twitter has enjoyed huge success throughout 2009, having continued to grow from its substantial origins in 2008. It has attracted a steady stream of media buzz along the way. It's not just for the average Joe anymore. Athletes, movie stars, and politicians all now tweet. According to Nielsen, traffic to the network's website has increased 1,448 percent year-over-year in the month of May, from 1.2 million unique visitors in 2008 to 18.2 million in May 2009. Facebook, at 350 million users worldwide, is still the foremost channel for marketers in the U.S. and many worldwide markets. In 2010, it will surpass its former rival, MySpace, when marketers worldwide will spend $605 million on Facebook versus $385 million on MySpace. The question for 2010 is what is the effectiveness of Twitter marketing, particularly in comparison to more traditional media. Although access to the network is free, maintaining an effective presence is both time and labor intensive, and the ROI on such activity remains difficult to gauge. Not every Twitter message creates a sale. Separating the sales purely attributable to Twitter is very difficult. One positive aspect of Twitter is its observable cause-and-effect nature: post on Twitter and then track sales and view streams or downloads that came as a direct result of that post. The value of frequent Twitter posts that have no specific marketing message is not observable. While there is value in communicating with your followers, no hard number can be placed on that value. And unless you are already a celebrity, building a Twitter following can be costly. "Social media marketing gets a lot of attention, and there are some great practitioners in that space, but there aren't many examples of that activity translating into concrete, tangible results," said Jeff Dachis, former Razorfish CEO and founder of social technology consultancy Dachis Group. Although Twitter is "ad free," many brands have set up self-promotion Twitter accounts. Moving forward, Twitter may find that it needs to begin to regulate marketing activity more closely, particularly in comparison to other social sites such as Facebook. Marketers will be waiting to see what else Twitter has to offer in 2010 and if those features are worth paying for. According to new research from The Boston Consulting Group, consumers are willing to spend small monthly sums to receive news on their personal computers and mobile devices. In a survey of 5,000 individuals conducted in nine countries, BCG found that the average monthly amount that consumers would be prepared to pay ranges from $3 in the United States and Australia to $7 in Italy. John Rose, a BCG senior partner, said "Contrary to conventional wisdom, consumers are willing to pay for meaningful content...(but) they are not willing to pay much." In addition, says the report, consumers are more likely to pay for online news provided by newspapers than by other media, such as television stations, websites, or online portals. They are specifically not interested in paying for news that is routinely available on a wide range of websites for free. These findings will benefit newspapers with unique voice and reporting and with strong subscriber bases, such as national and local newspapers, which have content not available elsewhere, while major metropolitan daily newspapers will likely struggle, concludes the report. In the U.S., advertising, which accounts for around 80% of newspaper revenues, is in a steep decline. If consumers pay for their news online, it will slow, but not stop newspapers' decline, says the report. The report suggests that several hybrid models for accessing news and content will emerge. For example, 52% of U.S. consumers of business news would be interested in a bundled print-and-online subscription, compared with just 35% of young consumers. Marc Vos, a Milan-based partner and leader of BCG's media sector in Europe, says "Newspapers should be experimenting with paid online content. It will take trial and error to find what works." 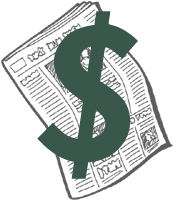 On the flip side, a Forrester study reported in an OPA Intelligence Report by Mark Glaser, found that 80% of Americans were not willing to pay for newspaper or magazine content online. Glaser says that with all the noise around erecting pay walls online, two different surveys tried to find out whether people would actually pay up. But their results were also different. The Boston Consulting Group found that 48% of Americans are willing to pay for online news content, but only about $3 per month. But the Forrester survey, noting that while 80% of Americans were not willing to pay for newspaper or magazine content online, 8% said they'd pay one subscription fee for all content, 8% would pay for a combined print/online/mobile content subscription, and just 3% would make micropayments. AllThingsD's Peter Kafka is betting on the Forrester number, or one even lower, supported by the fact that the BCG study finds that readers "are specifically not interested in paying for news that is routinely available on a wide range of websites for free." The Newspaper Association of America is touting online behavioral targeting as a partial fix for the industry's revenue woes. "Targeted advertising shows significant promise for newspapers seeking new ways to support local journalism," stated the organization in comments filed with the Federal Trade Commission. Sophia Cope, legislative counsel at the NAA, adds that members of Yahoo's newspaper consortium have benefited from the company's online ad-targeting capabilities. "Based on preliminary results, it looks like targeted advertising will be one of the solutions that helps newspapers get back some of their revenue," said Cope. The NAA says that Yahoo's newspaper consortium has generated at least $50 million since last year. The initiative involves Yahoo powering behavioral targeting for some newspapers' websites, among other features. "The newspaper industry wants the flexibility to figure out what's going to work," said Cope. "The industry needs time to figure out what solutions will rise to the top and be successful." The NAA estimates that by the end of December, newspapers' ad revenue will have plummeted almost 40% in two years. The trade group argues in its comments that a regulatory framework requiring companies to obtain users' affirmative consent to online tracking for ad-targeting purposes would be impractical. "While newspapers support robust consumer notice and choice, newspapers worry that a government-mandated 'opt in' choice mechanism for 'third party' targeted advertising may not be workable in practice," the organization wrote. The NAA adds that requiring online readers to opt in during their initial visits would "degrade the user experience and make it difficult to communicate the benefits of targeted or interest-based advertising." Privacy advocate Jeffrey Chester, Executive Director of the Center for Digital Democracy, says he disagrees with the NAA's stance. "It would be more effective for newspapers' branding to be known as the place where privacy is respected," he says. "Just because everybody is engaged in this data collection melee doesn't mean everyone has to do it." Chester, who is also slated to speak at the FTC's workshops this week, adds that many people visit news sites without realizing the extent to which they collect data. "Few readers know that newspapers are stealthily watching every story they read, tracking them story to story," he says. 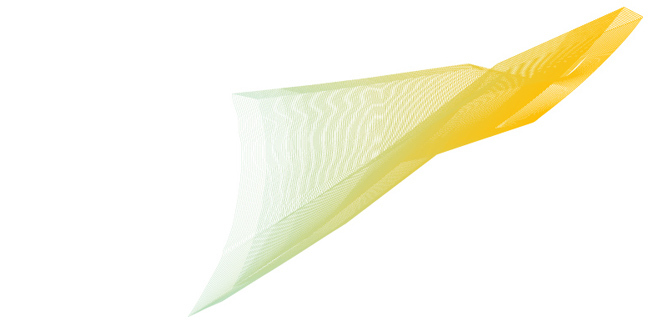 "No one knows that news sites have become a data collection den." Current industry self-regulatory guidelines and FTC recommendations call for companies to notify consumers about online ad targeting and allow them to opt out. Chester and other privacy advocates have recommended moving to a system where websites and ad companies can collect and retain nonsensitive information about computer users for up to 24 hours, unless people opt out. After that initial period, the companies would need consumers' opt-in consent to retain the data. Marking an apparent shift from its position last year, the newspaper organization praised the FTC's recent endorsement of a voluntary notice and opt-out regime. But in 2008, the NAA warned that even voluntary guidelines could have an impact on newspapers' First Amendment rights. On Tuesday, four leading U.S. magazine publishers announced the long-anticipated debut of an independent joint venture to create a shared publishing solution for digital versions of their content. The virtual retail operation—which brings together Conde Nast, Hearst, Meredith and Time Inc.—will focus on formulating standards that allow publishers to create and deliver digital editions of magazines, newspapers, and other text-focused products to mobile devices, including the new generation of e-readers from Amazon, Sony, and Dynamic Logic. News Corp., which publishes several major newspapers in the U.S., is also participating in the consortium. In pursuit of this goal, the venture has four immediate objectives: creating a feature-rich reading application compatible with a wide range of publication styles; an associated publishing platform compatible with various mobile devices, operating systems, and screen sizes; a digital storefront allowing readers to choose the titles they want; and options for interactive advertising. In addition to publications from the venture partners, the platform will be open to other publishers as well, offering consumers greater choice and advertisers greater scale. Time Inc.'s John Squires, who is the interim managing director of the joint venture, stated: "For the consumer, this digital initiative will provide access to an extraordinary selection of engaging content products, all customized for easy download on the device of their choice, including smartphones, e-readers, and laptops." 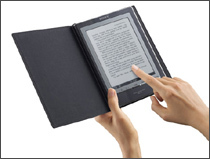 Over the last year, there has been a surge of interest in e-readers among consumers and publishing industry executives; in fact, several of the participants in the joint venture are developing their own proprietary e-reader technology, in coordination with the joint venture itself. Conde Nast said it is developing e-reader software based on Adobe AIR for its big titles, beginning with Wired, while Hearst is touting Skiff, a new device and software platform for viewing digital content on various portable devices. Recently, newspaper publisher McClatchy unveiled plans to introduce Kindle-compatible editions of five newspapers: The Sacramento Bee, Charlotte Observer, Fort Worth Star-Telegram, Anchorage Daily News, and Raleigh's News & Observer. Research outfits are also scrambling to get a handle on the demographics of the new device owners. Two weeks ago, Mediamark Research and Intelligence released the results of a study that found people who own electronic book readers are better educated and more affluent than the average American adult. Overall, 2.1 million American adults own an electronic book reader, according to MRI's estimate, with a gender distribution that somewhat favors men (56.3%) over women (43.7%). Adults ages 35–54 are the most likely age cohort to own an e-reader, with a 20% greater probability than the general population. MRI also found that e-reader owners are 11% more likely to own their own home, 87% more likely to have an annual household income over $100,000, and 111% more likely to have a bachelor's or postgraduate degree. In keeping with their tech-savvy reputation, MRI also found they are more likely to be heavy Internet users. Consolidated media reports present the full strength and depth of your audience reach. They allow advertisers to see all channels and products available to them in a single, uniform audit report. Advertisers can buy a single product or across multiple products using this all-in-one report. 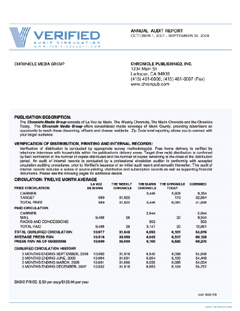 Verified has been providing this type of consolidated media report for years. These flexible reports combine multiple products on a single report. Reports can include several similar products on a report with a sum for total circulation. The Advocate Weekly Newspapers, which includes the Hartford Advocate, New Haven Advocate, Fairfield Advocate, and the Valley Advocate, combines the total circulation for the papers as a sum on the first page of the audit report and breaks out the individual circulation of each paper in the interior of the report. Reports can also include a diverse range of products. The Argus Observer is a paid carrier delivered newspaper published six days per week, the Treasure Valley Reminder is a free weekly shopper delivered by mail, and the Independent Enterprise is a paid weekly newspaper delivered by carrier and mail. They all share a common report which shows the range of options available to advertisers who want to reach consumers in Eastern Oregon and Southwest Idaho. Consolidated media reports are highly customizable. Products can be grouped by category, by geography, by frequency, or by many other criteria. The reports provide advertisers with a clear view of an entire media footprint across a range of print and digital products. Providing information in this format can help tell the advertising story more effectively. 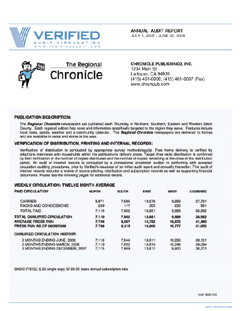 If you have questions about consolidated media reports, please contact Verified at 415-461-6006.